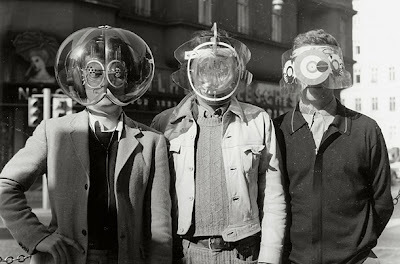 Haus-Rucker space age designs from the late 1960's and early 1970's. 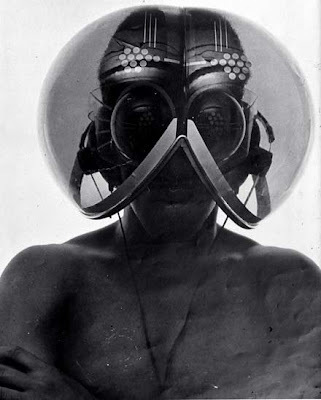 Haus-Rucker designed the Mind Expander in 1967. The seat shell fixes two persons in a certain position. The lower seat allows one person to sit with their legs slightly open. The thigh of their right leg rests against a step forming the transition to a second seat area that is higher by the thickness of a thigh. 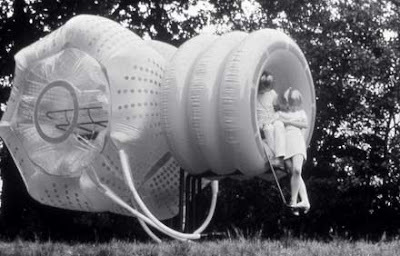 A helmet-like balloon that is connected with the seat can be tilted over the heads of the two people seated. Their heads thus are enclosed a narrow cylindrical space that is covered by a glass-clear plastic dome above which a transparent balloon hovers. 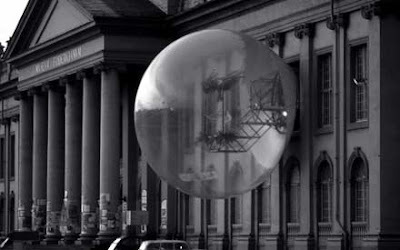 A series of lines and stamped-out shapes made of reflective foil are placed on both the dome and the surface of the balloon in such a way that, depending on whether you concentrate on the level closer or further away from you, the elements constantly overlay each other to form new patterns. Environment Transformers from 1968. These Environment Transfomers are appliances that change sensory impressions for a limited time in a visual and acoustic way. The processes of seeing and hearing are drawn out of their habitual apathy, separated into their individual functions and put together again as special experiences. Imagine your reaction from your boss when you arrived at work this way! 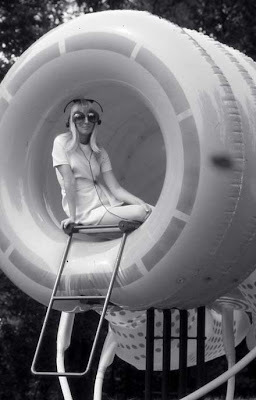 Yellow Heart Space Age living installation in Vienna 1968. 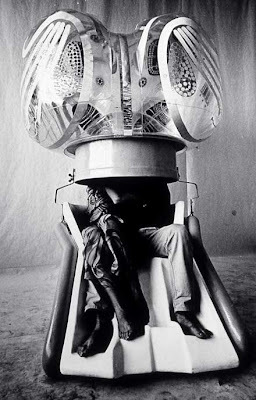 The idea that a concentrated experience of space could offer a direct approach to changes in consciousness led to the construction of a pneumatic space capsule, called the 'Yellow Heart'. Through a lock made of three air rings one arrived at a transparent plastic mattress. Offering just enough space for two people it projected into the centre of a spherical space that was made up of soft, air-filled chambers. Lying there one could perceive that the air-filled "pillows", whose swelling sides almost touched one, slowly withdrew, that is to say the surrounding space appeared to expand, finally forming a translucent sphere and then, in a reverse motion, flowed out again. Large dots arranged in a grid on the outer and inner surfaces of the air-shells changed in rhythmic waves from milky patches to a clear pattern. The space pulsated at extended intervals. 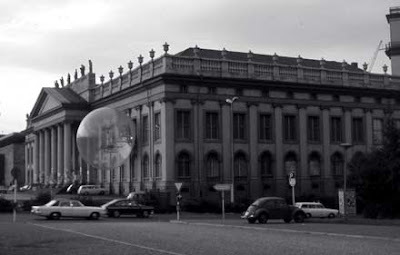 This contribution was produced in response to an invitation to the Documenta 5 in Kassel: a transparent sphere with a diameter of 8 metres was placed in front of the main facade of the Friedericianum. A catwalk made of standard tubular steel sections projected through a window from the interior of the building. A tubular steel ring was fixed to this footbridge, at a slight distance from the façade. This ring formed the external support for a PVC foil shell that formed a sphere when inflated into shape by an air pump. Internally it was the connecting element for a short tunnel made of the same material that had large zips at either end and thus functioned as a kind of airlock.